A lecturer in the University’s College of Environmental Resource Management, has won the Vice-Chancellor’s Prize for the Best Research Proposal at the just-concluded International Foundation for Science (IFS) Grant Application Write-Shop, organised by the Directorate of Grants Management. 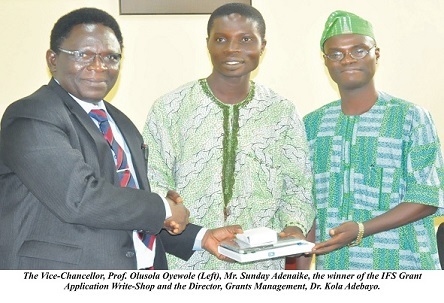 The winner, Mr Sunday Adenaike, whose research proposal was selected as the overall best, scored 43.3 points out of 50, to beat 11 other researchers to the prize of an i-pad, which was donated by the Vice-Chancellor. The recipient thanked the Vice-Chancellor for the prize, which he referred to as a “booster and encouragement to do more”, as he charged young scholars to study hard and harness every opportunity that comes their way. The Director of Grants Management, Dr Kola Adebayo, disclosed that the proposals were scored based on completeness, timeliness of submission, clarity/scientific validation, relevance of proposal and a grasp of other research activities going on in the institution. He added that the Directorate will soon hold another Write-Shop for the Third World Academy of Science Grant, which will only be open to young academics, not older than 35 years.